A couple of months back, I was approached by the Director of Marketing at the Westfield UTC regarding licensing one of my photos for a large scale commercial display. Now that the project is complete, I can share the results with you. The Westfield UTC is an upscale mall located in the University Town Center area adjacent to the University of California in San Diego and the beach enclave of La Jolla. The mall recently underwent a major renovation and art is a major theme. 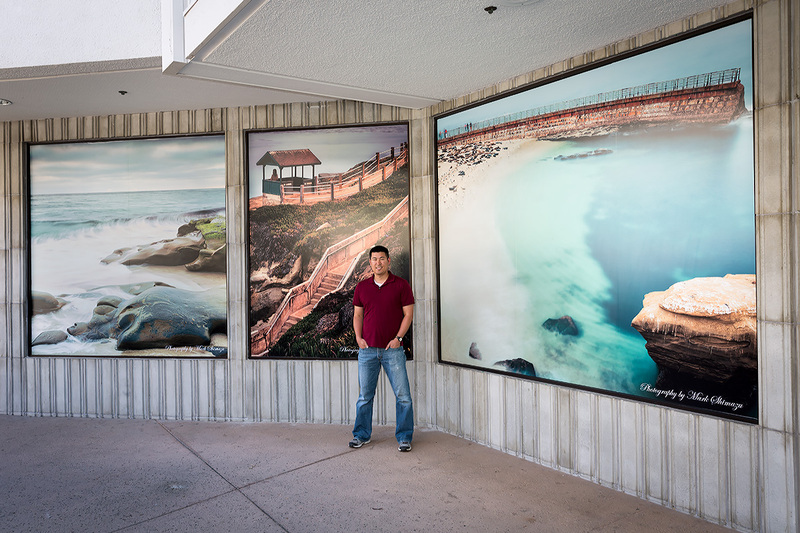 The plans called for a large five panel photo display of scenes in La Jolla and the surrounding coastal areas. I was initially approached due to the client’s interest in my Scripps Pier image (probably my most popular photo as I have been asked for license of this file on numerous occasions). A Google image search had led the client to my blog. This really emphasizes the necessity for good Search Engine Optimization or SEO. Had I not tagged my photos with good search terms (with the help of my fabulous wife who, in her previous life, was in marketing ) and made my photos “visible” I would never have gotten this sale. Even if you do not intent to license or sell your photos, good SEO leads to more hits to your blog from search engines such as Google, Yahoo and Bing and is worth doing and doing well. When I met with the client and was shown how large my photos were going to be printed, I have to admit, I was a little nervous. The panels were approximately 94″ x 94″ or nearly 8 feet across and high and were going to be displayed where the viewing distance was going to be measured in feet and not yards. I stand around 5’11” so you can get a sense of scale of the display with me in front of it. Before I fully committed to the project, I did tons of research to determine if the images from my 5D Mark III would hold up to such an enlargement, and it turns out that they do. So just think about this the next time you are wondering if your modern DSLR is capable of even 11″ x 14″ prints (which seems to be a questions that comes up often on forums). Viewing at around 1-foot distance, there is minor pixelation (remember the majority of these prints are a square crop and if the original 3:2 aspect ratio would have been preserved, it would have represented a print measuring 141″ or nearly 12 feet on its long end!). At a viewing distance of 3-feet, the image looks very clean and at a normal viewing distance of 6+ feet, the images look spectacular. Prints this large also emphasize something I am a huge proponent of, getting it right in camera. With the really high megapixel cameras these days, it is easy to perform sloppy compositions (tilted horizons are a huge pet peeve of mine) and to simply say “I’ll just crop or fix it in post processing”. The images used for this display are either not cropped at all (aside from what was required to fill the display windows) or cropped very minimally to fix minor leveling of the horizon line. Due to the final output size of these images, I needed all 22 megapixels my camera was capable of producing. So next time you think, “I’ll fix it in post processing”, resist the urge as you never know when you might need all those megapixels. For those interested in the technical details of these images, I shot them as RAW files then imported them into Lightroom where I performed global adjustments. Next I imported them as 16-bit TIFFs into Photoshop where I applied additional processing. Finally, the files were saved as uncompressed TIFF files (around 250 MB each) and the printer was able to work with these files for the final output. Email me using my Contact Me page if you want more specifics. I know I have a few local San Diegans who follow my blog. If you get a chance, please go and check these images out in person. They are in the general area of where the Nordstroms is located and the display is right next to the Restoration Hardware. For those non-locals following my blog, you can check out the individual photos from the 5 photo collage using the links below. Congratulations! I’m sure it is an awesome feeling. Thanks Owen. Definitely something I was/am very excited about. Kongo doesn’t reblog many posts but this is a very special one. The monkey discovered Mark several months ago on WordPress and was instantly inspired. His beautiful images of iconic views around San Diego has sent the monkey packing to try to do similar shots. His advice on photography and camera gear is always spot on and Kongo has ended up spending lots of money following his advice. Mark always describes how he makes an image so you can learn a lot as you enjoy the effect. This post is of Mark’s first large scale display at an upscale shopping center in San Diego. As usual, the effect is stunning. I hope you check out Mark’s blog. You will be inspired too! Thanks for the reblog Kongo! Mark, this is fantastic. Congratulations! As usual your advice is informative and spot on, particularly the bit about pixel size an large displays. I do almost all my editing in Lightroom band never thought about converting them to TIFF and moving them over to Photoshop but now that you describe it, that makes great sense to me for a project like this. 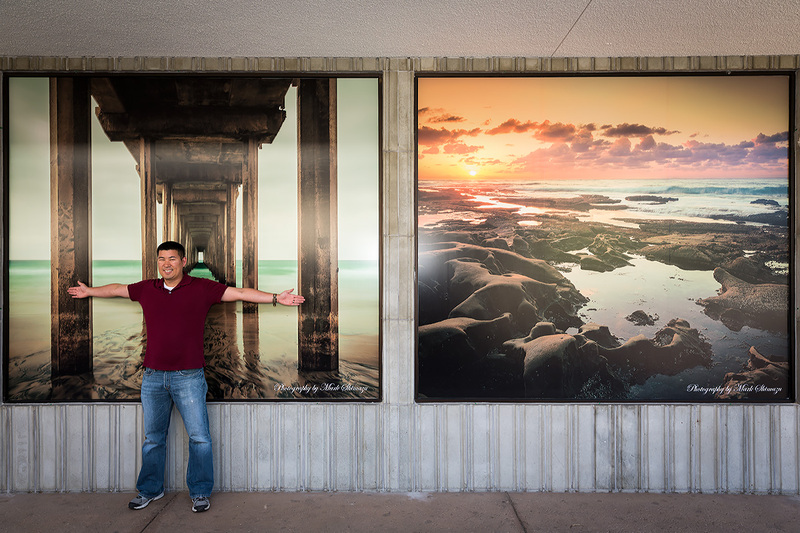 I hadn’t seen your photo under the Scripps Pier before and it is magical and I now well know the challenges of that photography spot. (I think my tripod was probably in the same sand spot your was!). I do hope our paths cross in the real world some time. Again, congratulations on an absolutely wonderful commission and I’ll be stopping by UTC soon to check it out. Thanks Kongo. Yes we seem to shoot the same spots but at different times. Perhaps we will met on location one day either by chance or by planning. Keep shooting those iconic San Diego scenes. Congratulations !Well deserved at that. Your pics are absolutely wonderful ! Shared on my FB & Twitter. Isn’t it stunning with a real sense of pride to see your photographs hanging larger than life – for hundreds, if not thousands to enjoy. Wow, congratulations Mark – it’s a very big deal. Thanks Mary. I never thought my photos would be on display at such a large scale. It is definitely encouraging and motivates me to do even better. This is fantastic news, and well deserved. Your shots are incredible, so it is great to see them up in public, in such large scale and must give a huge tip-of-the-hat to you on this achievement. It is inspirational to us all…so well done. Congratulations Mark! Thanks for the kind words Randall! Thanks for your kind words Tanja and for continuing to show interest in my posts. Hope all is well in Berlin and I am sure you are looking forward to the autumn colors. Wow! congratulations, these look very impressive at this scale. Congratulations Mark! I could not agree more about getting it right in camera; Photoshop should never be a crutch for sloppy technique. It certainly is fun to make big prints too..! Thanks Michael. Part of the fun is time out practicing the craft and for me getting it right in camera is part of the challenge and enjoyment of the process. The beauty of your photographs touching my soul and brings me to tears. Your work is the definition of art to me. very nice and so many get to enjoy them – congratulations! Thanks Sheila. I am excited that so many people will be viewing my photos. Congratulations! :-) your pictures are great and they definitely deserve the attention! Congratulations! You handled very important work. I hope that you connect it in the future. Congratulations Mark!!! Those big prints are magnificent! Must be a great feeling to see your work on such a big scale! Congratulations Mark! Your work deserve to be in the best galleries! My boyfriend and I are planning a visit to San Diego soon, and I’ll make sure I visit this place!! Thanks Yael. You guys probably already have plans, but I would recommend including Balboa Park and La Jolla Cove to your list of destination. Congratulations Mark! This is fantastic. A very nice display. Well done, congratulations Mark. I was at the mall yesterday and went to see them. Very nice! Even took some photos of me in front of them. awesome, awesome, awesome!!! haven’t been active on the blog for quite some time…CONGRATULATIONS!! Is this a permanent display? Thanks Brian. This is part of a rotating display that exhibits photos from around Coastal San Diego 3 months at a time. The Westfield UTC has commissioned the next display to go up after this one.